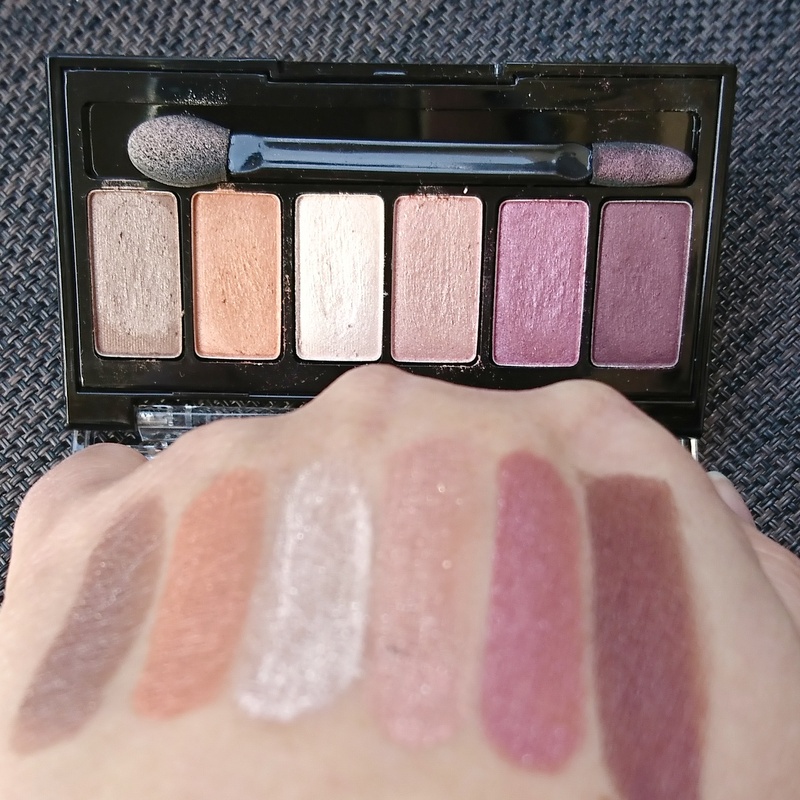 So today I want to show you this beautiful palette and swatch the colours! 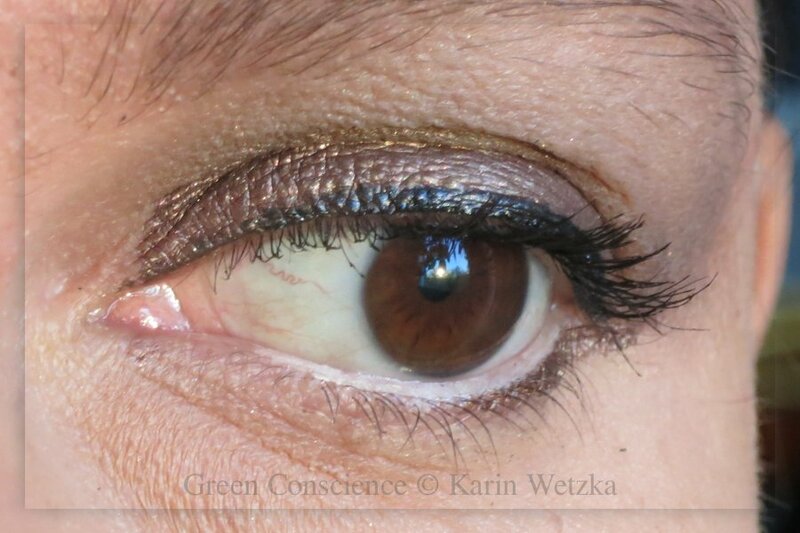 The brown tone is a medium shimmery brown with some minor glitter particles. Just depotted some eyeshadows. To get the glue melted I used a hot-or-cold compress. You can manage the right temperature quite good, and the compress fits all sizes of shadows. Easy to get them out! 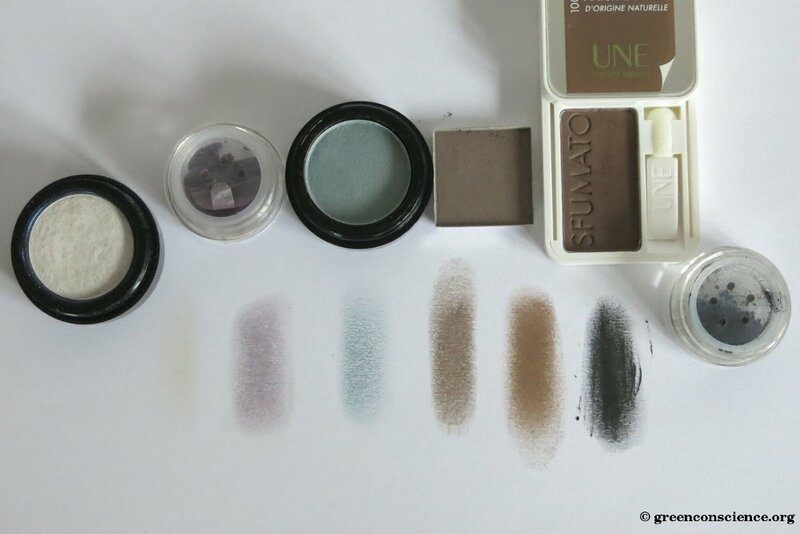 In the picture you can see #drhauschka, #terranaturi, #alverde and #benecos #eyeshadows in #mauve, #taupe and #greige as well as #dustwhite and #lightrose. I made those names up so you get the point with those type of colours. I was not able to find an eyeshadow palette with such hues, do you know one? View in Instagram ⇒ for more comments or feel free to comment here! In this photo I wear the Inika lipliner in “sugar plum” and lipstick in “orchid fields”, and a dab eyeshadow “copper crush” in the middle of the lower lip. I also wear the eyeshadow as an eyeliner. Blush is Inika’s pot blush in “pink pinch” on mineralfoundation in “patience”. Both are very subtle on my skin and leave the focus on my lips. 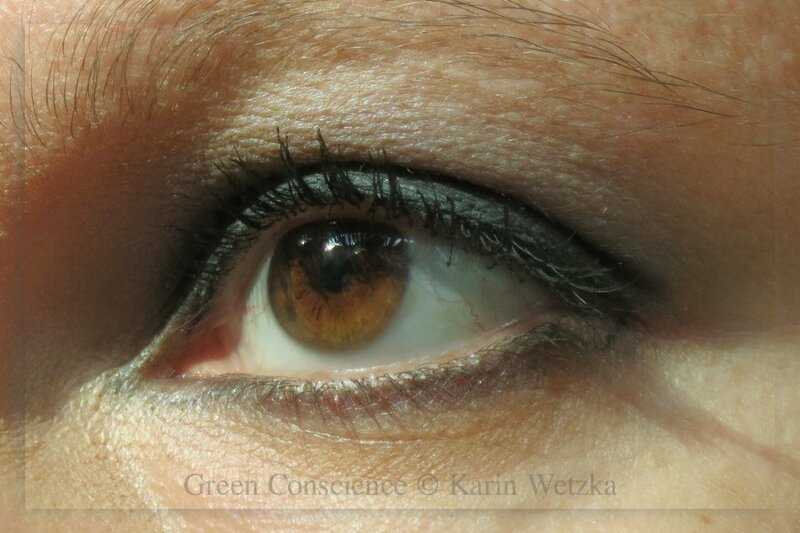 The mascara is Marie W. in “rabenschwarz” (thanks to @herbsandflowers, it is an ongoing pleasure using this! 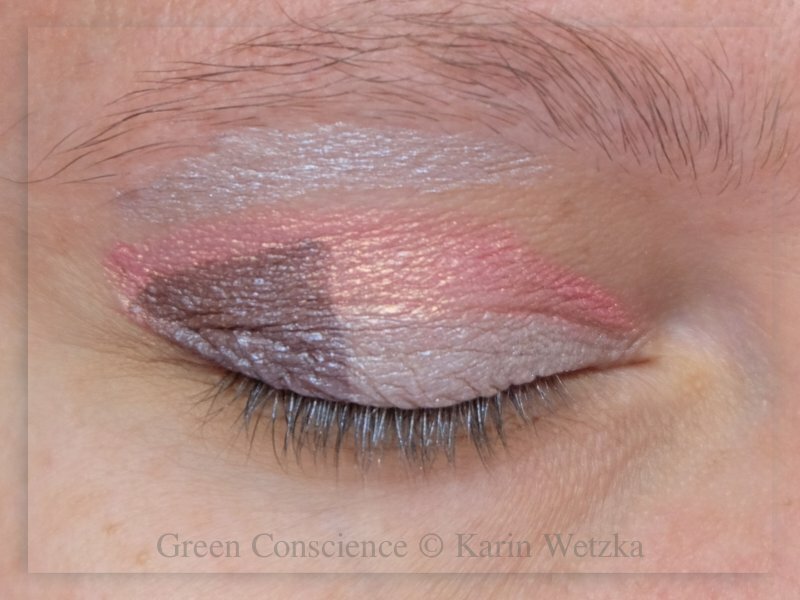 ), and I used the Dr. Hauschka pink eyeshadow on the complete lid to even out the skin tone before applying the liner. The eyeshadow and mineralfoundation are PR-samples from @knospa, the rest is my own stuff which I won or paid for myself. View in Instagram ⇒ for all the comments, or feel free to comment here! 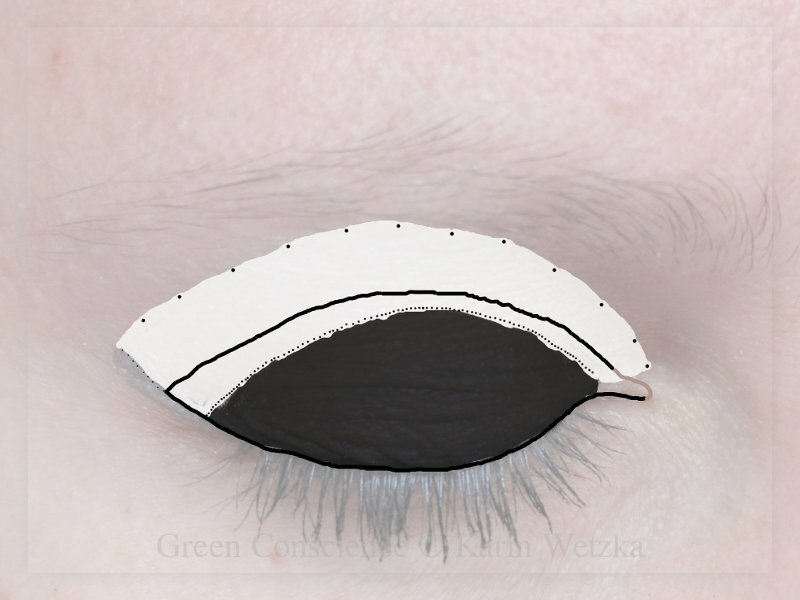 Here is another very simple eye make-up for you. 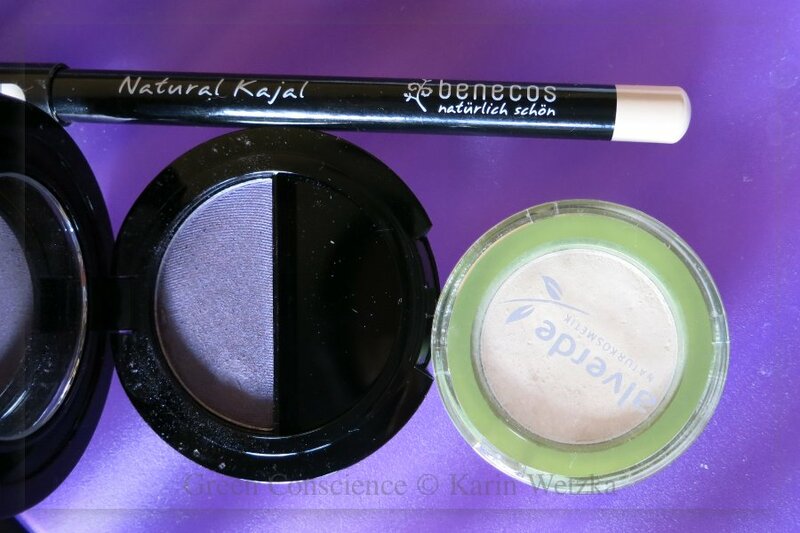 Everything you need is lilac and white eye shadow, a white kajal liner and some mascara. With the lilac eye shadow I cover the moving part of the lid. With the white one, I blend it up to the brow bone. 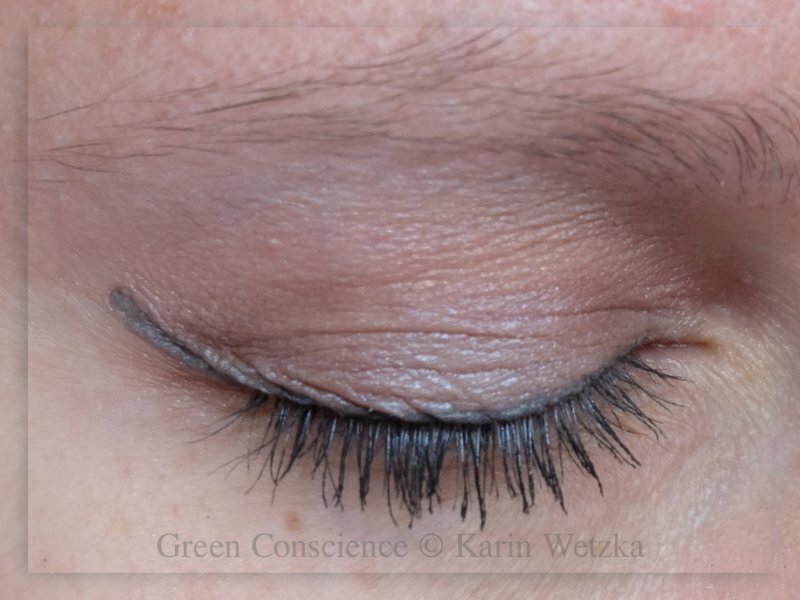 Using a very fine wet eyeliner brush, I draw a lilac line at the upper lashes. With the same brush, I add a little color beneath the lower lash line. Then I apply white kajal liner on the lower water line. Some grey mascara, that’s it! This look is not impressive, but it is a nice detail. I like to wear lilac and violet tops, and a hint of those colors on my eyes makes the look somewhat complete. Easy eye make-up with Hiro rock chique & go vertigo! I mixed both colours together, than applied them with a wet brush. White eyeliner on the lower lash line and black eyeliner on the upper lash line give some more expression to the eyes, and black mascara is a must for this look. 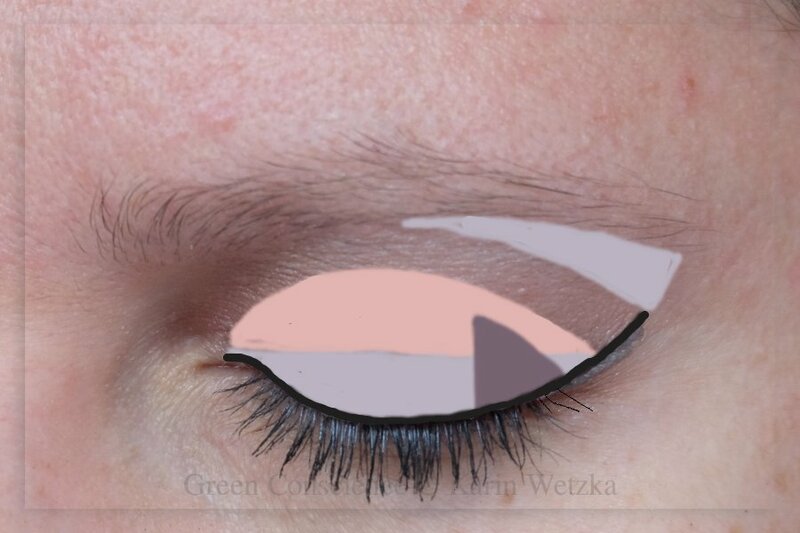 Instead of drawing a hard black line at the outer corner of the eye I softened out the eye make-up with the grey shadow. I am tanned a little now, and the copper & brown colour matches beautifully with my brown eyes and the sun kissed skin. Applying mineral powder eye shadows with a wet brush is as easy as painting with watercolours, if you haven’t yet, you should give it a try! 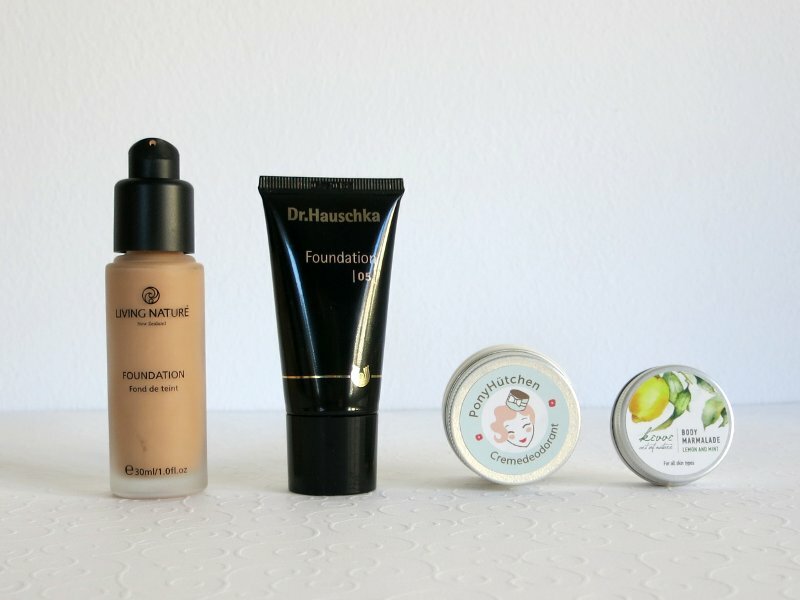 Which is your favourite mineral cosmetics brand? 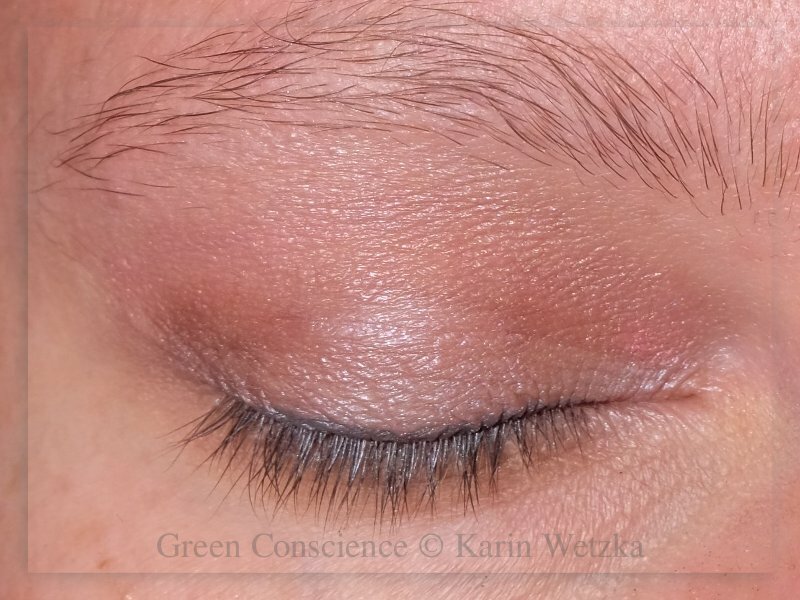 In my Vivaness posting I promised to show you a really simple eye make-up. 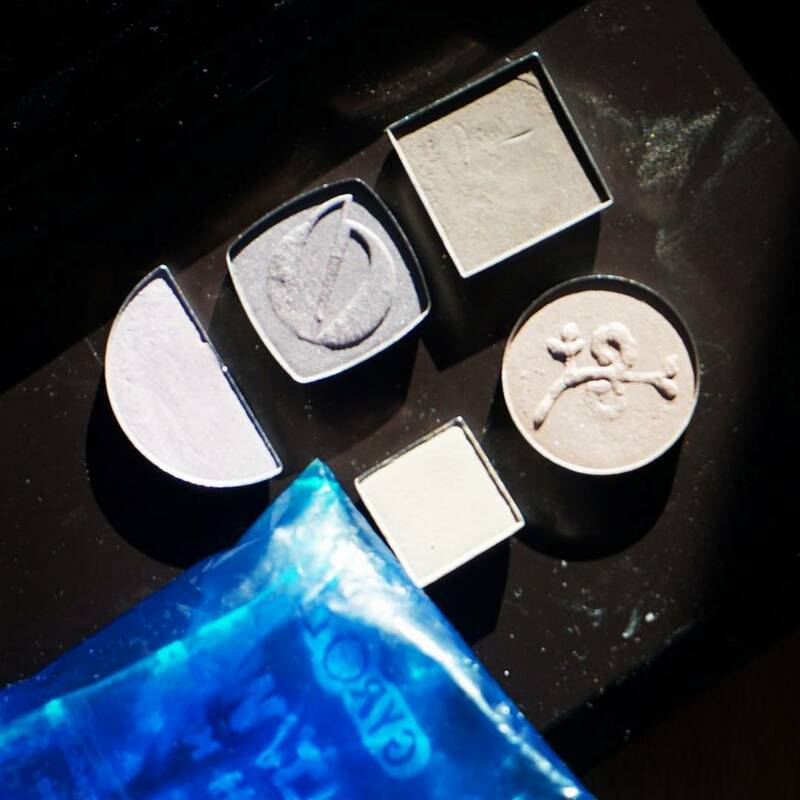 To give you an impression of versatility and manageability of the Zuii colours I choose the Zuii certified organic flora eye shadows in purple ice and black diamond ♦. Purple ice is a white colour with purple and blue halo effect, black diamond comes in a very pigmented true black with subtle reflections. 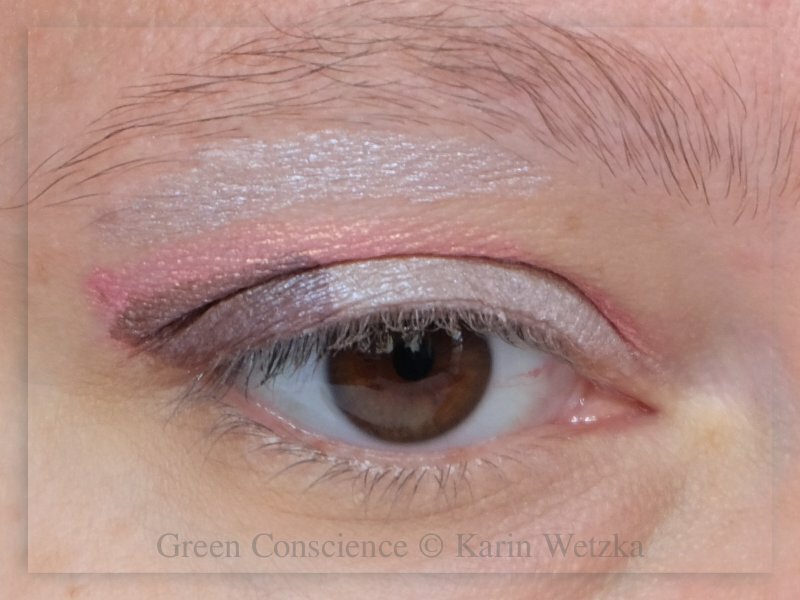 As the eye shadows can be used wet and dry, I doubled the colour as eye liner. You can see where I put the wet brush onto the surface. Apart from those two shadows you only need two blending brushes, a liner brush and a black mascara. I applied the white colour in the crease and up to the brow bone. On the movable part of my eyelid I applied black. 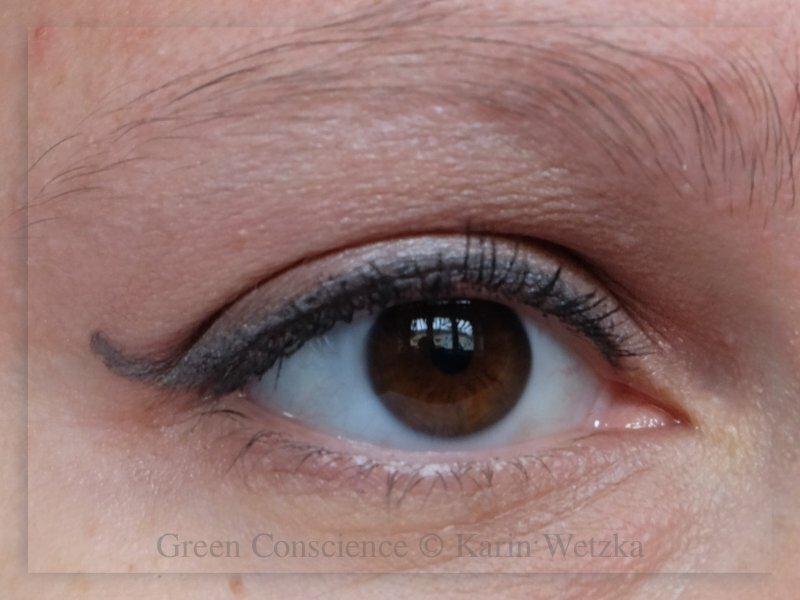 As you can see, the part between the black line and the black dotted line (which is how much skin disappears in my crease) is coloured with the white shadow. 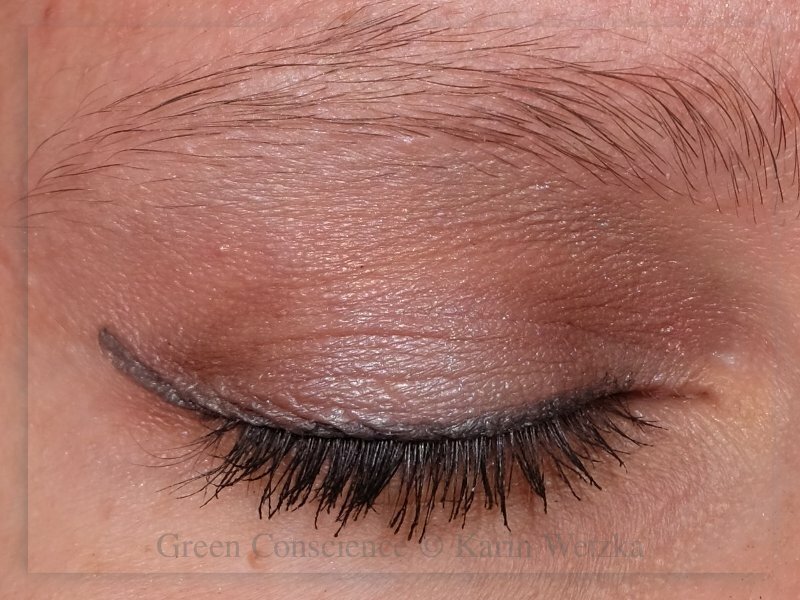 With a blending brush I blended the black colour into the crease to get a grey tone. 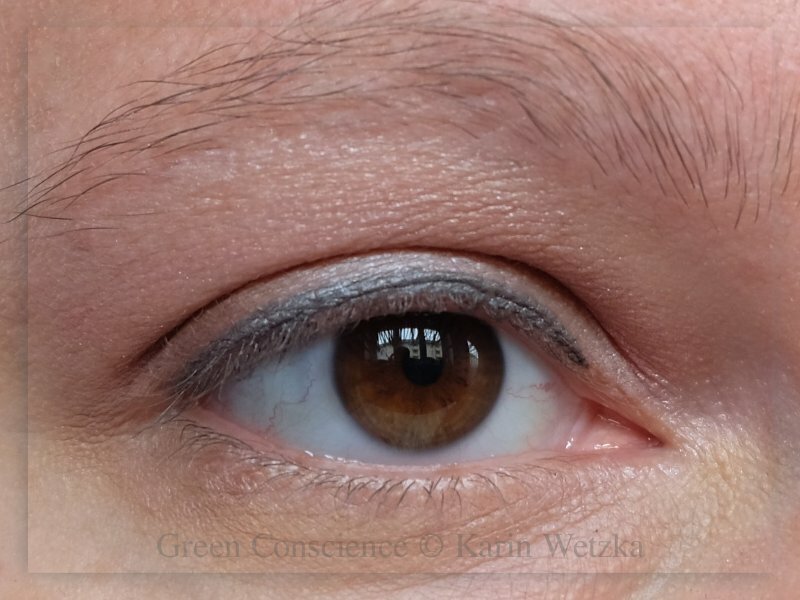 After that, with a fresh brush, I blended the grey with the white to soften the colour between crease and highlight under the brow. Then, with a wet liner brush, I painted a fine black line directly into the lash basis. With the residue on the brushes I added a little colour to the lower lash line as well. Finally I applied two coats of black mascara. If you are not into black and white, I would recommend the classic duo palette with bronze (dark brown) and mustard (natural beige). And if you are more into colour, try one of the eye quads. They come in several combinations of blue, green or rose to more classic ones like brown or grey. What are your favourite eye shadow colours? 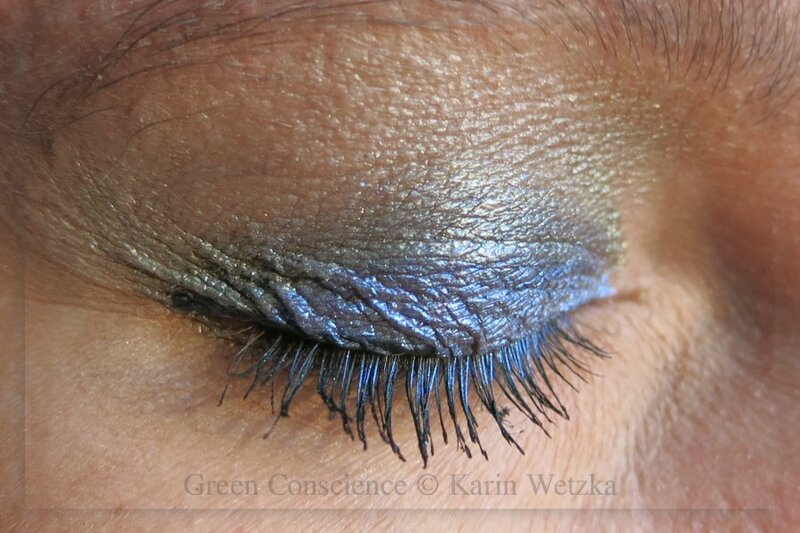 Don’t be afraid to experiment with bright coloured mineral eye shadow! 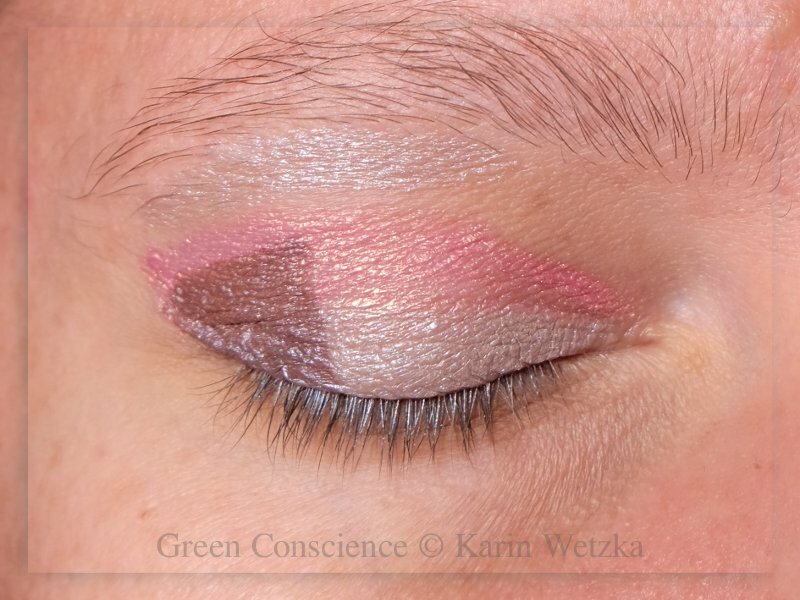 Sunnivah, one of my favourite beauty bloggers, did a tutorial about eye make-up with four colours for total beginners, and I instantly wanted to create an eye make-up for me. 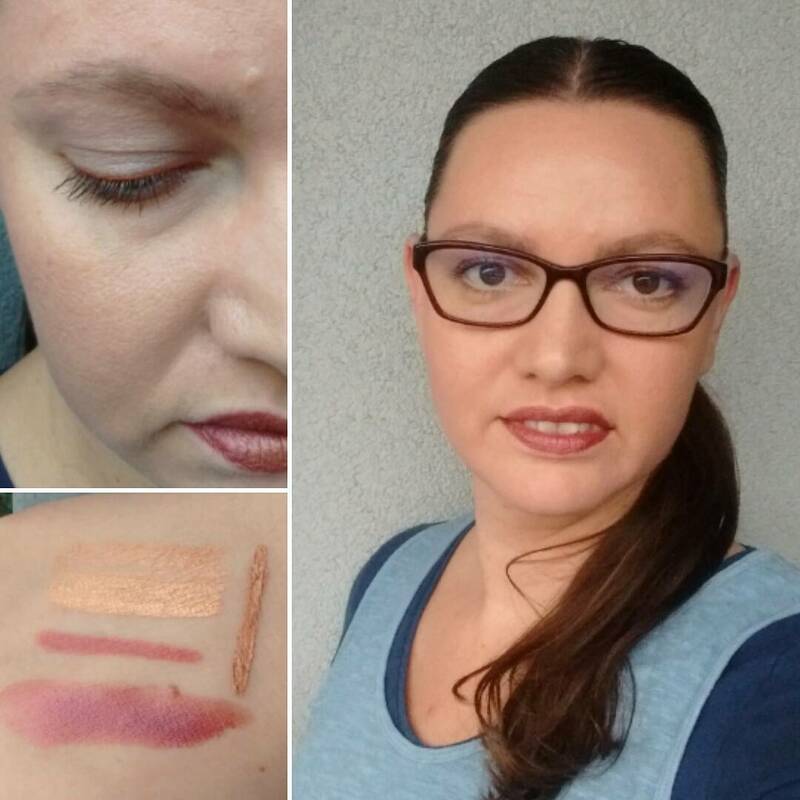 As a quick overview I took three flash photos for you, the first one shows the applied colours, the second one the blended colours with eye liner, and the third one the finished eye make-up with winged liner and mascara. I applied lilac shimmer eye shadow on the lower lid with a wet brush. 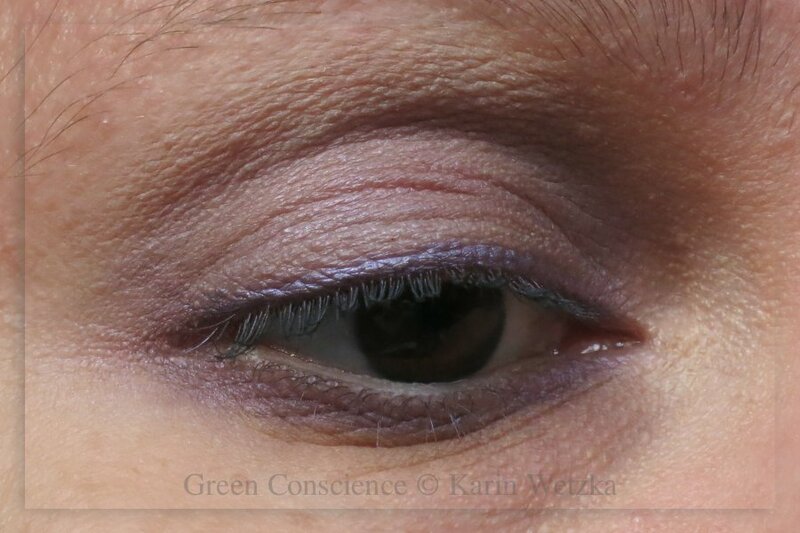 With the same lilac colour I highlighted below the brow. With a rose-and-golden shimmer eye shadow on a wet brush I covered the upper lid right up to the crease and slightly above. 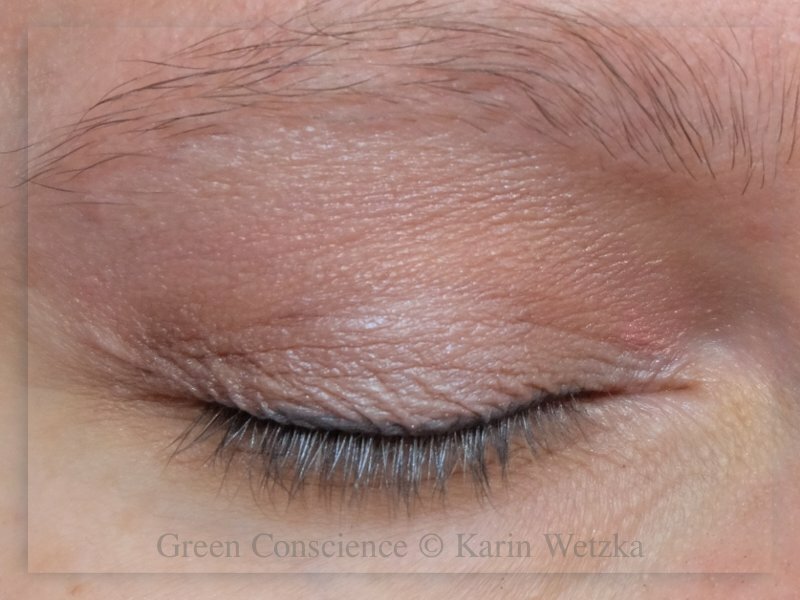 You can see two lines at the top of my eye: the upper line indicates how far up I have to apply eye shadow so it can be seen when I open my eyes. The dotted line just below the upper line indicates how much of the colour will be seen when I open my eyes. So quite a lot of the rose-and-golden eye shadow is nowhere to be seen because of my hooded eye. 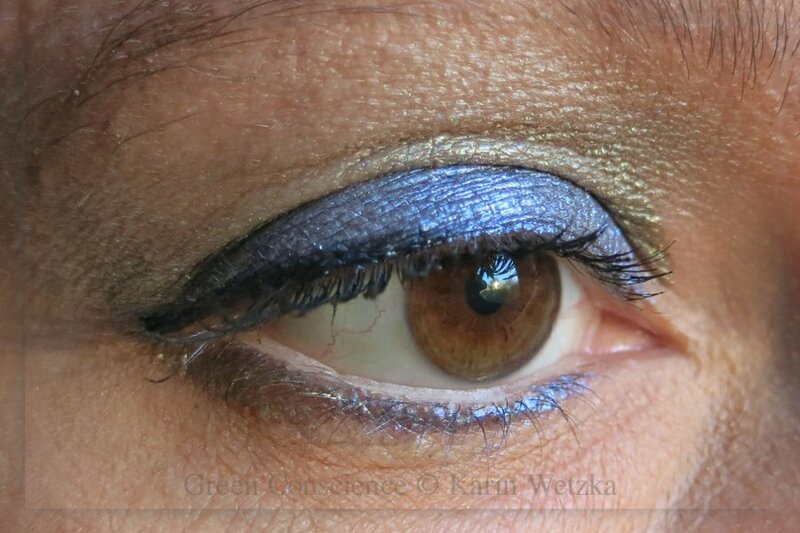 I applied a burgundy-brown blue-shimmer eye shadow with a wet brush at the outer triangle of the lower eye lid. I blended all colours to a smooth and soft eye make-up. I applied dark grey eye liner. I applied two coats of black mascara. These are the colours when applied wet. 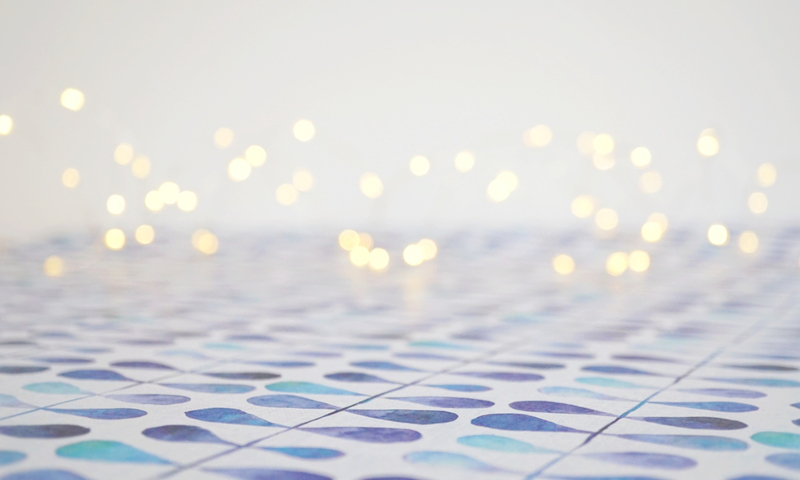 They are very bright and can be placed really precisely. My eye is only half open to give you an imagination of how much of the colour will be lost even though I applied a generous amount. When blended, a lot of coverage is broken down to shimmery dust that blends with the other colours. 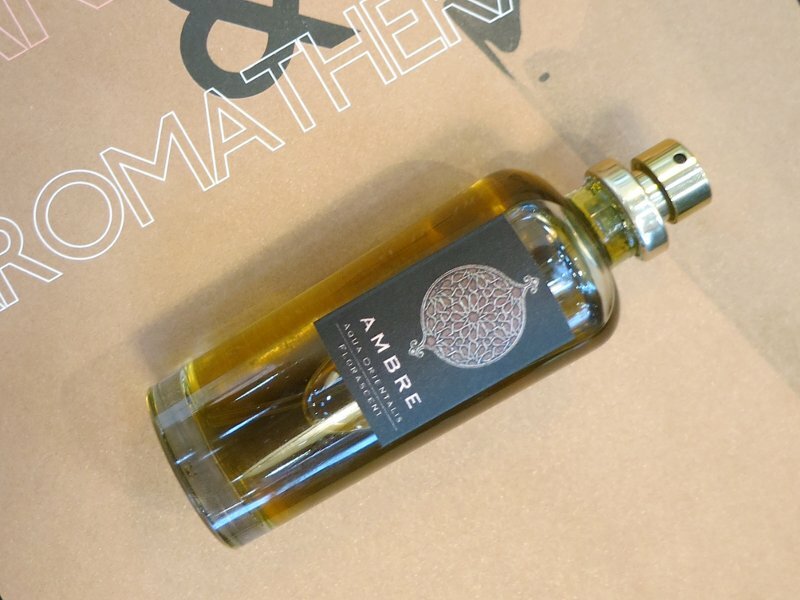 What is left is a hint of lilac, a hint of rose, and a hint of burgundy. The rest stays in the blending brush. So don’t blend to much so all of the colour is lost! … and applied two coats of mascara. 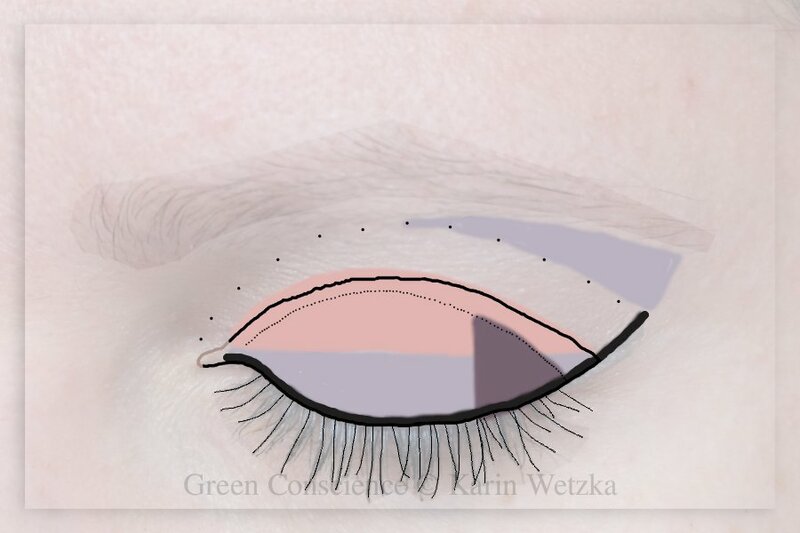 How do you like the schematic draft of my eye make-up? In my beauty stash I have some eyeshadows and lots of eyeshadow samples. 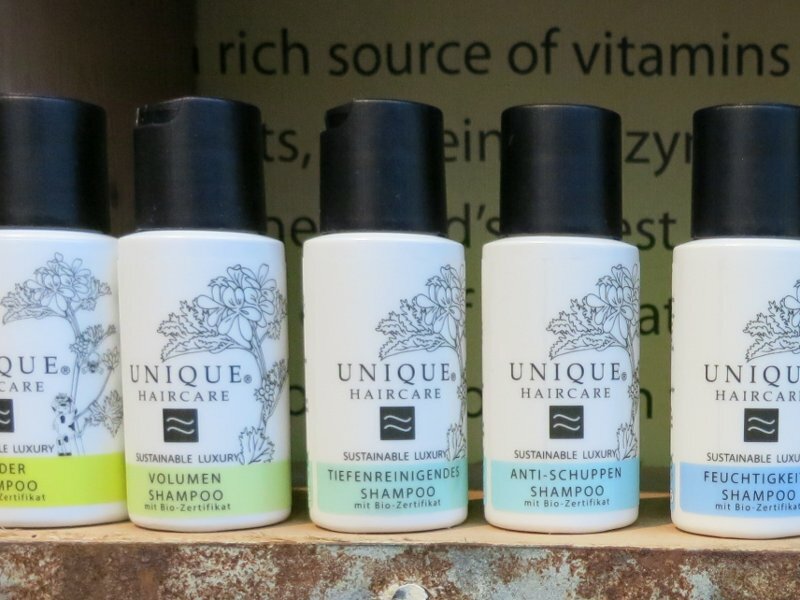 But what I’m really looking out for is a green (organic) palette that fits my colour range. Here it is, my personal palette to start with, if someone would ask me! 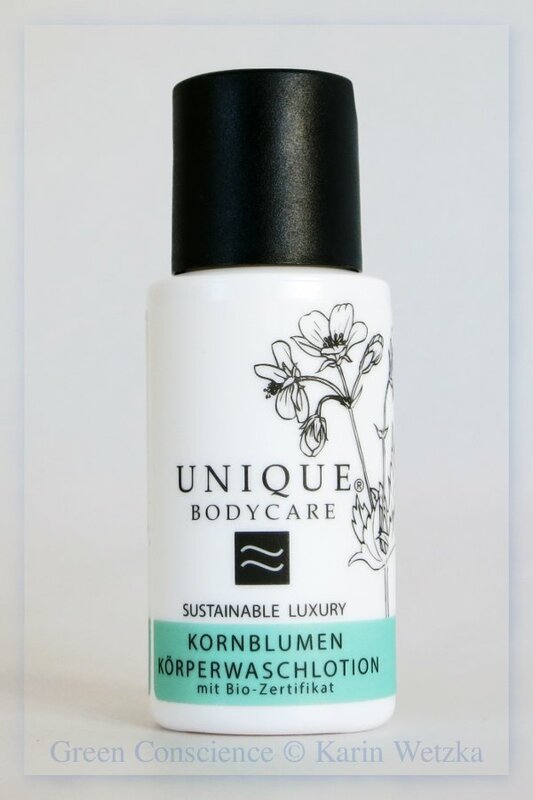 from Zuii and works really well as a highlighter. But it can also be layered onto every other colour to give it a violet and not-so-matte finish. 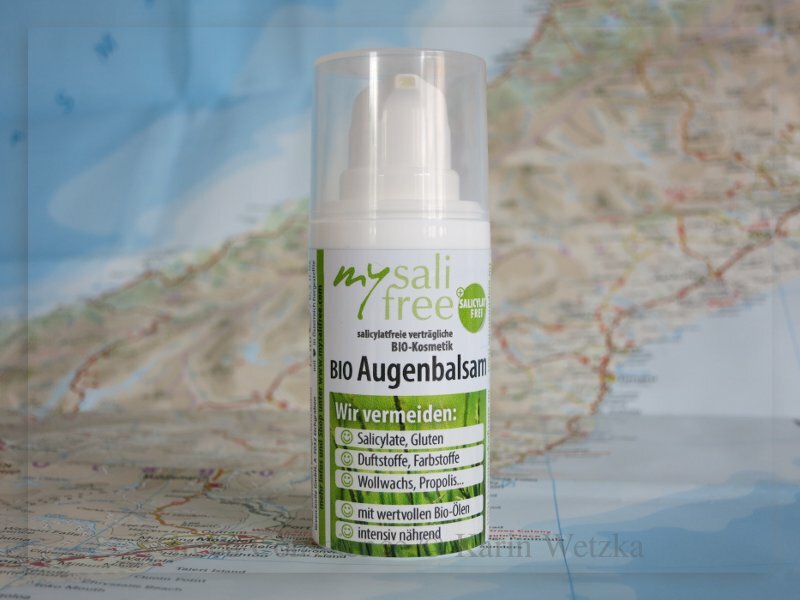 It is buildable from soft reflection to noticeable effect. Next, there would be the ChriMaLuxe Minerals eyeshadow in Eggplant. The colour is purple with a hint of lavender and combines nicely with the purple-white highlighter. 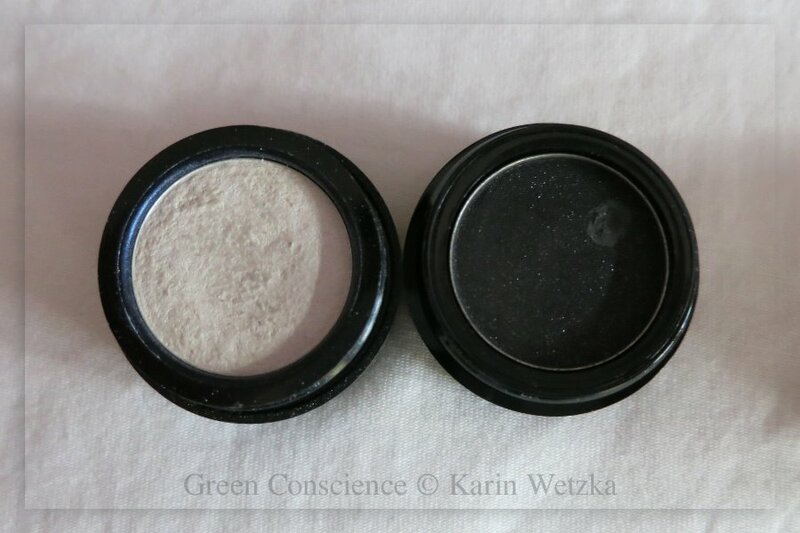 This is a matte one, but as I said, the Zuii white gives every shadow a soft light reflecting finish. 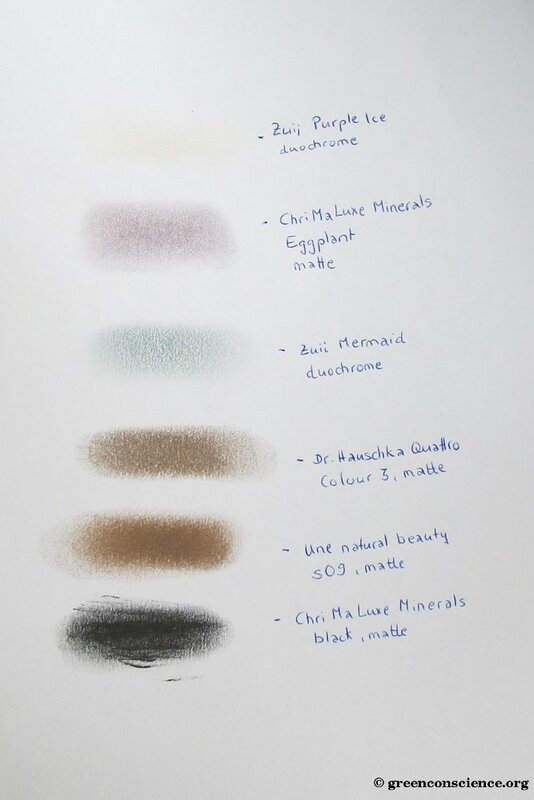 I really like duochrome eyeshadows combined with matte ones, so the third one would be a Zuii again. Mermaid is a bluish green (or greenish blue) duochrome colour that shifts to golden-yellow. Nice! 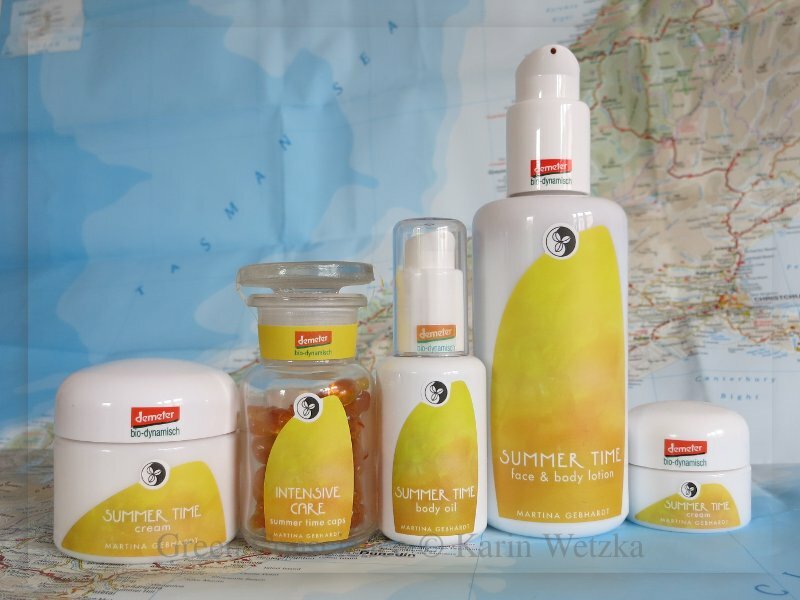 Dr. Hauschka has a palette with neutrals, and I picked the third colour, a matte, cold to neutral soft brown. It is almost taupe, especially when you only layer a thin coat on your lid. It helps to blend colours and gives a silky soft contour to your eye. 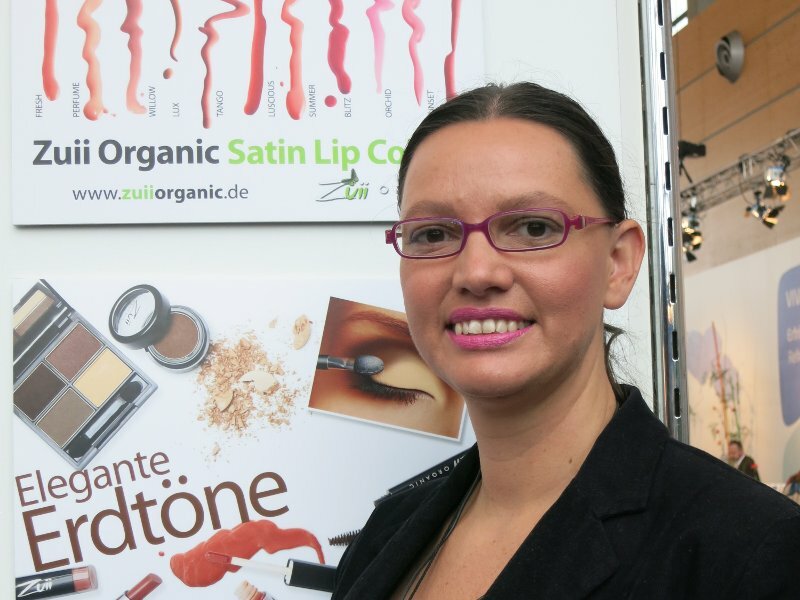 Not to forget a warmer brown tone, also matte, from Une natural beauty: S09. This colour is the only warm one in my palette as I do not like too much warmth in my make-up. It is very versatile, though, and makes a good start for a brown smokey eye. The last colour would be a matte Black from ChriMaLuxe. It is the blackest black without shimmer or glitter, and it can be (carefully) mixed with all other dark or matte colours to darken them. 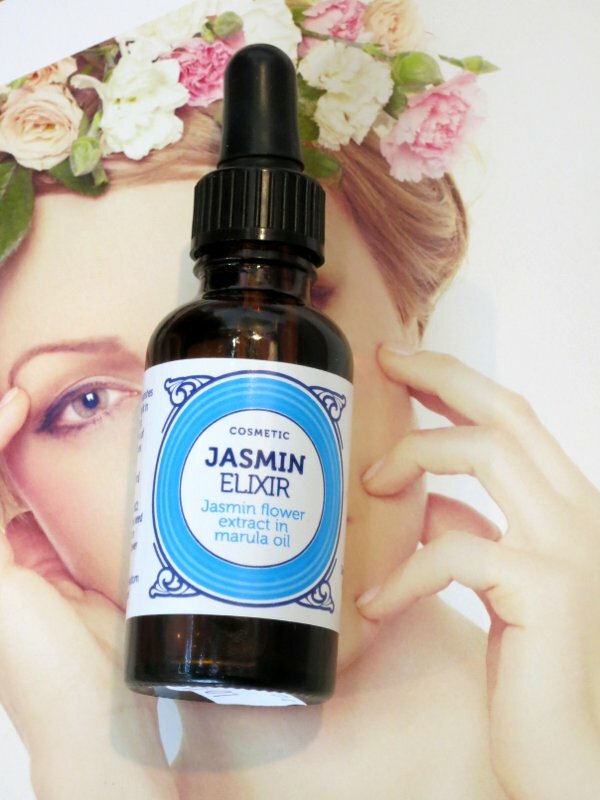 It works great as eyeliner, too, you can apply it with a wet eyeliner brush. Not to mention single use, what can you do with these six colours? 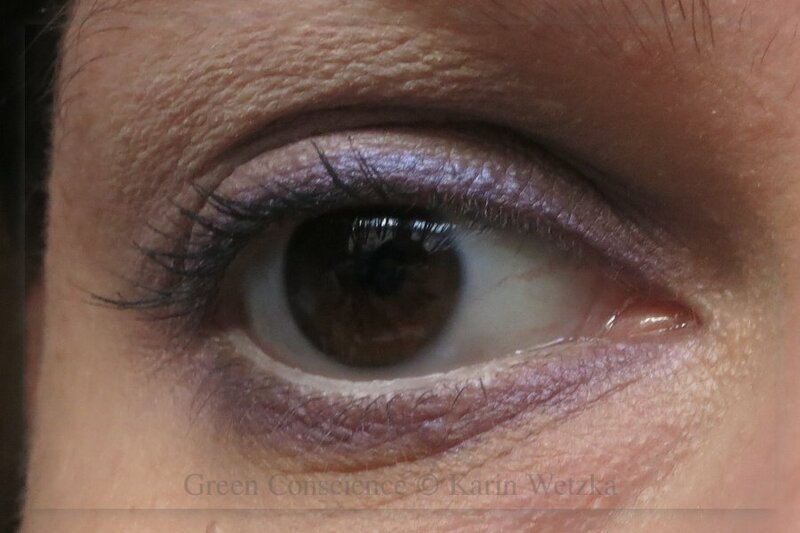 Eggplant as main colour, highlights with Purple Ice, Black eyeliner. 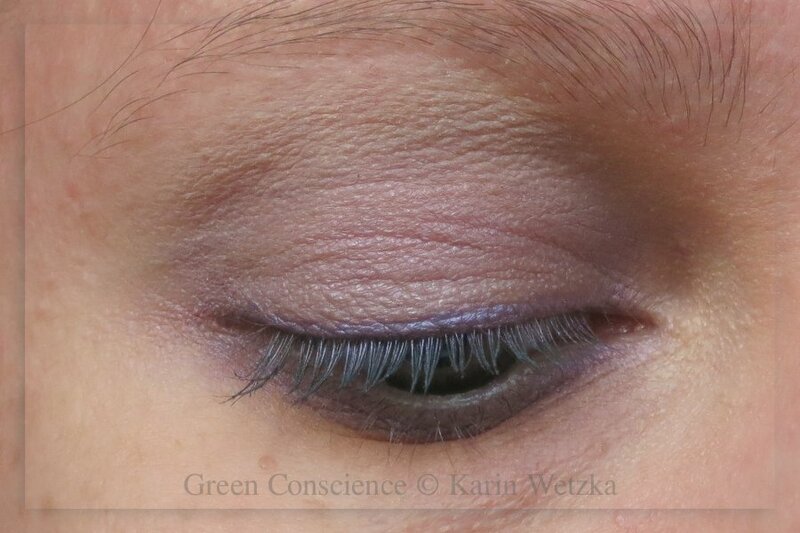 Mermaid with Hauschka (Mermaid in the inner corner, Hauschka in the outer corner of the eye) and eyeliner of Eggplant mixed with Black to a very dark Taupe. For the time being I wait for the Lily Lolo palettes to be available, and I laid my eyes on the Zuii Glamour palette. So who knows what future will bring? Which are your favourite colours and what would your basic palette look like?